Dr. Joseph Michael Levry (Gurunam) has spent over 30 years studying, researching and teaching the sacred sciences of Kundalini Yoga and Kabbalah. He is the founder of Shakti Naam Yoga and is a prolific writer and recording artist, having published a substantial number of books and mantra CDs. The practical applications of Dr. Levry’s work are covered in his books Lifting the Veil, Alchemy of Love Relationships, The Healing Fire of Heaven, The Code of the Masters, Shakti Naam Yoga and The Divine Doctor. He has produced many Mantra CDs which can be used for various purposes including healing, protection and to reinforce the overall benefits to be gained from his teachings, his unique style making them instantly recognizable. Among his most popular recordings are Triple Mantra, Ra Ma Da Sa (to the tune of Pachelbel), The Seal of Higher Destiny, Mystic Light and Om House. November 25th, 2012, Dr. Joseph Michael Levry had over 15,000 people attending his Naam Yoga Class, held at the Monument of the Revolution in Mexico City. This is a new world record attendance for a yoga class. Since the age of 12, he has been trained in the esoteric arts and sciences and initiated into many spiritual orders, through which he learned the science of Kabbalah. Using his books and lectures, he has illuminated the symbols of Kabbalah, symbols which were once kept secret within the doctrines of Judaism, Christianity and other religions. He is able to precisely diagnose physical ailments, through his unique ability to see and analyze the energy field, and this has earned the trust of even the most skeptical. One of his greatest achievements was to create a unique synthesis of the most powerful teachings of Kabbalah and Kundalini Yoga, to not only uplift people, but also to help them avoid adversity and improve their lives. 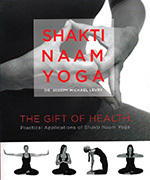 This gave him a firm foundation upon which to build his Naam Yoga system. It is his belief that nothing is done by chance, and that it is possible for one to rewrite his or her destiny through the knowledge and correct application of this divine spiritual wisdom. Gurunam, his spiritual name, was given to him by Yogi Bhajan. "Gu" stands for darkness or duality and "ru" stands for light or divinity. "Nam" means the power of the spoken word or sound. The name "Gurunam" therefore means a person who uses the power of the word or sound to bring light into people's lives. A resident of California, Joseph Michael Levry also holds a Master of Science degree in Industrial Engineering. He currently travels for a substantial part of each year, lecturing throughout the world on yoga and healing, principally teaching in New York, Los Angeles, Sweden, Germany, the UK and France. Below you will find our selection of products by Joseph Michael Levry - Gurunam. Enjoy our low prices and FREE US Shipping.